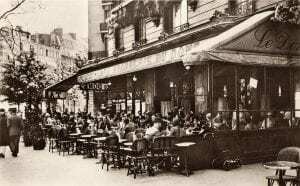 Today, the famous Montparnasse cafés have become quite upscale establishments, and it is hard to imagine that in their heyday a homeless apatride could nurse a single drink on a café terrace for the entire night. During les années folles, as the interwar period was dubbed in France, “Le Dôme,” “La Rotonde,” “La Coupôle” and other brasseries near the intersection of Boulevard Montparnasse and rue Vavin were the epicenter of transnational modernist culture. Legendary artists and writers of the time – Modigliani, Soutine, Aragon, Chagall, Man Ray, Hemingway, Picasso – all passed through Montparnasse. The star of Parisian music halls, the American dancer Josephine Baker, would sometimes arrive in a café in the company of her pet leopard. And many a painter’s muse, the model Kiki, would take a dip in a water basin at the centre of “Le Dôme” to cool down after a champagne-drinking marathon. Barely conspicuous in the bohemian crowd, young Russian émigré writers also thrived in this cosmopolitan and provocative environment. Alienated from their homeland, marginalized in their adopted country, and feeling constrained by conservative aesthetics prescribed by the émigré literary establishment, these young men looked toward European avant-garde for inspiration. Montparnasse offered a unique site where they could interact with Western peers and observe contemporary life, where hierarchies were suspended and where all cultural, ethnic and linguistic hybrids with unstable identities and precarious legal status could get a sense of belonging and relative freedom. The Montparnasse genius loci left an indelible mark on the style, thematic repertoire and personal lives of the young Russian writers. Many pages in the works of Gaïto Gazdanov, Vasily Yanovsky, Nikolai Otsup, Serge Sharshun, Boris Poplavsky (nick-named the “Prince of the Kingdom of Montparnasse”), and others contain colorful descriptions of a café scene, where, in Elsa Triolet’s words, “amidst the cigarette smoke permanently hung a scandal”. In this book I treat Montparnasse not just as a place of gathering or a background depicted in interwar art and fiction but as a creative locus that generated its own aesthetics and discourse. Born out of exile and existential anxiety, Montparnasse literature responded to unprecedented cataclysms that shook the world, and also reflected technological and cultural shifts of the interwar period. Arguably, the real shock of modernity occurred in the 1920-1930s. This was, by David Trotter’s definition, the first “media age,” when radio and telephone entered the homes of millions. Air travel, symbolized by Charles Lindbergh’s historic solo flight from New York to Le Bourget, altered conventional perception of distances, geography, and the rhythm of human existence. World wars, mass migration, flows of refugees; widely popularized scientific discoveries, including radioactivity; the rise of mass culture and commodification of artwork; the dominance of cinema and progressive visualization of culture in general; the cult of celebrity; skepticism about positivist ideas; and discrediting any rational forms of self-knowledge under the impact of Freudian theories – these were the key processes that marked a drastic break with tradition and defined the world as we know it. In the interwar period, due to new communication technologies, artistic styles, fashion, music and ideologies began to circulate rapidly around the globe. As the “cultural capital of the world,” Paris was at the nexus of these trends. My book was initially intended as a study of the prose fiction of the younger émigrés of the first wave, but then evolved into a reflection on the spirit and legacy of transnational modernism. Montparnasse became a metaphor for the interwar cultural production across Europe, which articulated the experience of modernity. It gradually became clear to me that Russian Montparnassians could not be understood only as an extension of the Russian national tradition, but had to be read against Hesse, T.S. Eliot, Aragon, Breton, Henry Miller, D.H. Lawrence, Bataille, Fitzgerald, Hemingway, and other writers who best expressed the sense of civilizational collapse and the advancement of a new era. Such works Georgy Ivanov’s nihilist “The Atom Explodes,” for example, condemned as provocation in Russian émigré circles, shares an aesthetic and conceptual lexicon with modernist texts like T.S. Eliot’s The Wasteland, Miller’s Tropic of Cancer, and Breton’s Nadia. 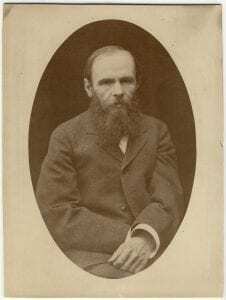 Ivanov, Yanovsky, Felzen, Bakunina, Adamovich, Poplavsky and other Montparnassians were among the first to realize that the Russian classical tradition was inadequate in the post-apocalyptic reality, and to set out to create a new language. 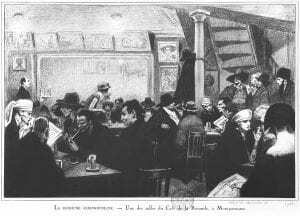 Cosmopolitan bohemia at Cafe La Rotonde, Montparnasse, 1924 by French School, (20th century); Bibliothèque Historique de la Ville de Paris, Paris, France. Archives Charmet/Bridgeman Images. Russian Montparnasse is a book about a transnational literary community that simultaneously drew upon, blurred and transcended Russian and foreign traditions and amalgamated different cultural lexicons and national narratives, anticipating more recent trends of cultural globalization. Their corpus of texts raises questions about the role in artistic expression of migration, borders, and dual identities. Today, the migrant has come to occupy a central place in arts and political discourse, prompting critics to rethink the relevance of conventional “national” affiliations for many authors and texts that thrive in the no man’s land beyond nation-states, languages and cultures – Rushdie, Nabokov, Kundera are just a few of the names that spring to mind in this regard. I came to think of Russian Montparnasse as an early unconscious attempt to open Russian culture to a transnational dialogue, to transcend the national agenda and to reconfigure canonical values. Exile, which these writers saw as their curse, in fact allowed them to discover new directions in verbal art. This book is a case study in transnational modernist literature generated by exile, dislocation and cross-cultural exchanges, focusing on the younger writers of the interwar Russian Parisian diaspora, known as Russian Montparnasse. Maria Rubins argues that their hybrid, bicultural and bilingual writing transcended the Russian national master narrative, anticipating more recent diasporic tendencies. The book sets the Russian Montparnasse corpus into trans-cultural and intertextual dialogues with key Western and Russian texts to demonstrate that their artistic response to the main challenges of urban modernity and cultural rupture resonated with broader aesthetic trends in interwar Europe. By systematically reassessing the role of Russian Montparnasse in the articulation of modernism, this study expands our knowledge of the evolution of the transnational literary canon, contributes to the academic debate about national vs. transnational analytical approaches to bicultural artistic production, and challenges the conventional status of language as the chief marker of literary affiliation.